Sister Miriam Ward, RSM (Dorothea Irene Ward), 88, of the Sisters of Mercy Northeast Community, Vermont, died in Fletcher Allen Health Care in Burlington on January 17, 2014, in her 70th year of religious life. Sr. Miriam was born in Salem, N.Y., on January 14, 1926, the daughter of Raymond and Dora (Douglas) Ward. She attended Proctor Elementary School, Middlebury High School, and Mt. St. Mary High School in Burlington. Sr. Miriam received her BA in English from Trinity College, an MA in theology from Providence College, and her PhD in religion from the University of Ottawa. Sr. Miriam entered the Sisters of Mercy on February 18, 1943, and was professed on August 18, 1945. She taught in elementary and secondary schools staffed by the Sisters of Mercy and was an instructor of religious education in many parishes throughout Vermont. Sr. Miriam was a professor of religious studies and chairperson of the Religious Studies Department at Trinity College and founder and director of the Annual Biblical Institute held at Trinity College from 1966 to 1990. She was a lecturer at Providence College and an adjunct professor at St. Michael's College. Sister Miriam has been a leader and a passionate force for global justice and peace throughout her lifetime. 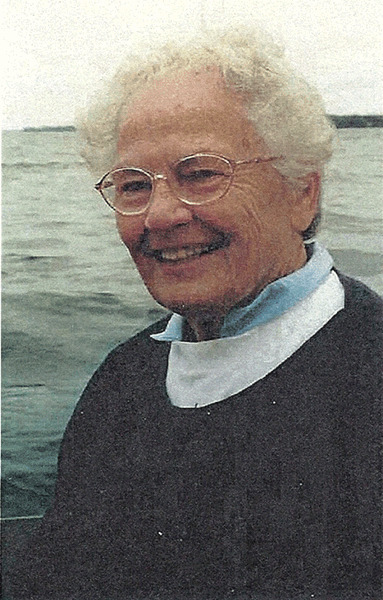 She was a founding member of Pax Christi Burlington. She also wrote many guest editorials and op-ed pieces on issues of peace and justice, particularly the regarding the Middle East, El Salvador and South Africa. Sister just completed a book for publication: Behind the Wall: Palestinians Under Occupation. Sr. Miriam received an honorary citation for "contribution to a better understanding of the Palestinian/Israeli conflict" by the Palestine Human Rights Committee, Chicago, and an honorary citation for "significant contribution to a better understanding of the Arab World" by the Association of Arab-American University Graduates, Detroit. Sr. Miriam was the recipient of the Janet Rogan Peace Award by Pax Christi Burlington. Sister was the founder of Vermonters for Middle East Peace and was a member of the Vermont Human Rights Delegation to El Salvador/Honduras. Sister Miriam is survived by her sisters, Ruth Mary Vahle of Baldwinville, N.Y., and Dolores Swanson of Thousand Oaks, Calif.; several nieces and nephews in the Robinson family in North Carolina, the Swanson Family in California, and the Ward and Vahle families in New York and Maryland; and also by her sisters in religion, the Sisters of Mercy. She was predeceased by her parents, Raymond and Dora (Douglas) Ward; and siblings, Robert, Thomas, James, Joseph, John, and Rose Marie. Mass of Christian Burial was be celebrated on Saturday, Jan. 25, 2014, at Mt. St. Mary Chapel. Arrangements were in the care of the Ready Funeral Home South Chapel, 261 Shelburne Road, Burlington. In lieu of flowers, contributions may be made to the Sisters of Mercy in support of their ministerial works, c/o the Life and Ministry Administrator, 100 Mansfield Avenue, Burlington, VT 05401.